Rich deciduous forests, conifer-hardwoods, sandy forested bluffs, occasionally in cedar swamps. The westernmost point in the range of this species (which occurs east to Gaspe and south in the Appalachians) is apparently in hardwood forest of the Huron Mountains in northeastern Baraga Co., except for a 1976 collection without habitat but said to be from “one mile east of Eagle River, Keweenaw Co.” It thrives especially well close to the Great Lakes and is less common inland. A tall shrub or small tree, this species has a trunk rarely over 20 cm in diameter, although trees as large as 35 cm occur in the Huron Mountains. 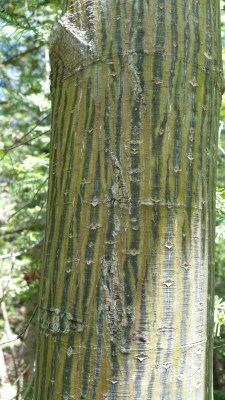 The bark of all but old trunks is a beautiful smooth green, striped with pale green or almost white lines. The distinctive leaf blades have three acuminate tips and are otherwise sharply and finely doubly serrate, often as wide as 15 cm or more; they turn a bright clear yellow in the fall. MICHIGAN FLORA ONLINE. A. A. Reznicek, E. G. Voss, & B. S. Walters. February 2011. University of Michigan. Web. April 21, 2019. https://michiganflora.net/species.aspx?id=2651.